Sarah Laughlin knows that gear can be a challenge for destination skiers. 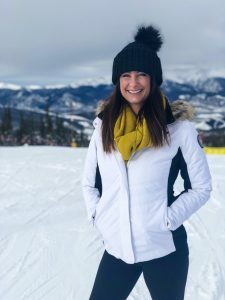 The Colorado native spent nine years working on the East Coast before moving back in 2017, and said her East Coast friends now want to visit and hit the slopes. But they’re faced with the challenges of either traveling with the bulky apparel, if they already own it, or buying it, which may not make sense if skiing isn’t a regular thing. Laughlin’s solution is Slope Threads, an online rental service she’s launched for ski clothes. As an MBA student at the University of Denver, Laughlin started working on her idea for Slope Threads with a group of other business students in January 2017. Upon graduation in May, she decided the business idea had legs and went full time with it. The apparel Slope Threads rents is made by Aspen-based Obermeyer, which Laughlin said gave her a discounted price. The company has enough inventory to outfit between 30 and 50 skiers at a time in each of her categories: men, women, kids and teens. Slope Threads charges $35 to rent a ski jacket, snow pants, gloves and goggles. Customers can also rent helmets, and purchase socks or base layers. Laughlin ships the gear to a home address or ski destination, and includes a bag with a return address for easy return shipping. The apparel is dry-cleaned upon return. Laughlin said she plans to keep the business online-only. “The beautiful thing about e-commerce is I can take orders and ship anywhere around the world,” she said. Laughlin also doesn’t plan to expand into ski or snowboard rentals. She said the logistics of shipping are challenging and up-front costs were too much for her self-funded business. Plus, the resorts already offer rentals. “I wanted the resorts to see me as a partner, someone who would bring more customers to their resorts,” she said. In the future, Laughlin plans to allow customers to purchase the apparel that they rent through Slope Threads. And she hopes to have a storage option near the airport for extra convenience. Laughlin had been running Slope Threads out of her apartment, but recently found a place near her home to store inventory before shipping it to customers.